Somehow, I managed to survive the Belgian Beer Weekend in Brussels and even enjoy it. That's a lot more difficult than it might sound. It's not the drinking of the beer that's so traumatic, but getting to that point in the first place. First, you show up at Grand Place and join the end of one of several queues, each with about hundred or so people in it, so you can buy the assorted tokens you need to then exchange for beer. The assistants behind the serving windows of the cash desks seem to be amiable enough, but they work at a pace slower than the evaporation rate of the liquid you are seeking to consume, taking up to ten minutes with each thirsty customer to count out the tokens, receive the money and exchange pleasantries. There are only six such cash desks as well, to maximise waiting times. Still, live and learn. Last year, I made the mistake of showing up on time for the start of the festival, only to end up seeing the cash desk windows close while I was still 20th or so in the customer queue. I never got drink a drop. This year, knowing better, I came an hour ahead of time, so I only had to wait about 75 minutes to get my tokens. Tokens, tokens... yes... 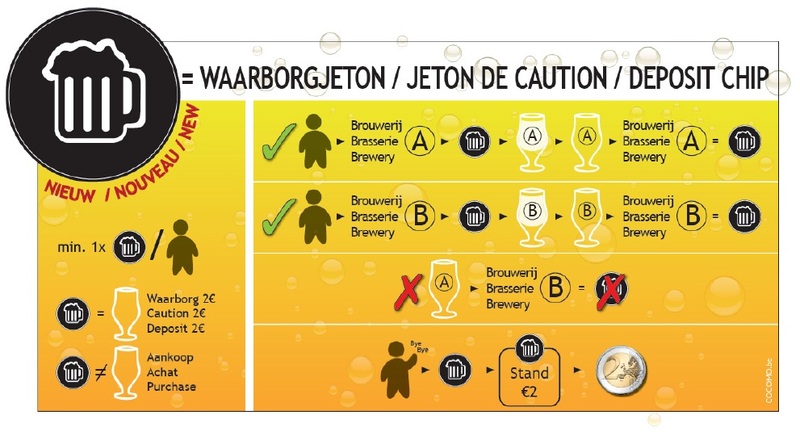 There are two types of them at the Belgian Beer Weekend, and I strongly recommend you attend the three-month course of evening classes so you can understand how they work. Or at least try to get your head around it before you start drinking -- if you hope to get that far. There is a second type of token you must also buy. It is a yellow piece of plastic with a beer mug on it, and it costs two euros. These are used to put a deposit on the glasses from which you drink the beer. On the chart explaining their use (see photo), the yellow "deposit chips" are shown as black, but don't let that distract you. The chart makes crystal clear that A does not equal B, and really, that is what you really need to know. In case you are a relatively normal person, and this chart leaves you scratching your head -- and there were a lot of itchy craniums in my queue, let me tell you -- what the hieroglyphics are trying to tell you is that you must use your black-but-really-yellow chip to put a deposit on the glass, but you have to return your glass to the right brewery to get your deposit chip back: brewery A glass cannot be returned to brewery B's stand. And putting a deposit down on a glass doesn't mean you can keep it. They check your bags on the way out. No joke. Anyway, once you have an unwieldy and bulky zip-lock sack of the special bottle caps and deposit chips, you can go to one of the various brewery stands and order a beer -- by this point, you certainly need it -- parting with caps according to a price list and one chip per glass. Cheers! Who invented this ridiculous system? The customer service staff of the business division of the Westvleteren brewery, perhaps? Who else could let hundreds upon hundreds of customers stand in motionless queues when they could instead serve them and take their money? Sure, making money is not the be-all and end-all of life, but in business, I cannot see any benefit in deliberately annoying customers, and hoping as many potential customers as possible flee in frustration to spend their money elsewhere. Don't get me wrong: I love the slow food movement. Quality food and drink should be produced and consumed with loving care and unhurried appreciation. But that doesn't mean the service of those products should function at a glacial pace or the payment system be labyrinthine. Raising ludicrous barriers to acquisition does not improve the overall taste experience. What is it with these token complications in particular? Why don't the beer stands all work with some easier form of compensation for their product? I could imagine many ways to improve this festival, but by far the best would be for the brewery stands to take a common form of inter-operable, physical monetary units, like, maybe, um, euro notes and coins? I mean, really, why reinvent the wheel with bottle caps and plastic chips? In our modern times, many businesses and their customers are turning to "cash" as a convenient and efficient way to work together. organisers to blame here. I've no idea what they're thinking, but they do a tremendous disservice to the promotion of this country's greatest product. They're not helping to win converts to quality Belgian beer; they're turning people off the whole concept. First was Witkap Dubbel, from the Slaghmuylder Brewery, makers of the delightful Witkap-Pater Stimulo and a tasty Paasbier. The dubbel was not quite as brilliant as those two, but it's respectable, for sure. It's quite refreshing for a dark beer actually, with a lemon note. Bob and I also tried Witkap Amber, which we found hoppy and drinkable but not remarkable. "It doesn't stand out", said Bob. Ename Dubbel I've had before and liked. It's a tasty, smooth dark, with a bit of nuttiness and raisin, all underlined by a good roast malt. Caracole was a new one for me. It's from the Brasserie Caracole in Falmignoul near Dinant. It's rich and thicker than it first looks, with a bit of syrupiness, even honey flavour, and then some notes of something like white pepper. It's not too bad for a sweet beer, and that's saying something, because I usually don't like the sweeter ones. Next to the festival stand of the Schelde Brewery, which is located way north, right on the border with the Netherlands. I'd never heard of this small producer before, but I liked every one of the four beers of theirs that I was able to try. Scheldebrouwerij Oesterstout is an excellent, complex dark beer. It's more than a stout, with resiny bitterness, sure, but also a creamy richness closer to a St Bernardus Abt 12, yet more herby. It's very challenging to capture all the tastes, but it's great. This one for me was "the find of the festival". Scheldebrouwerij Zeezuiper is a tripel with loads of herbal notes. Sharp, not sweet. Again, it's complex, worth another taste. Scheldebrouwerij Lamme Goedzak is a blond that's quite creamy, with a bit of aniseed developing mid-mouth, then evolving into burnt honey. Orange notes. Very good. Scheldebrouwerij Straffe Toeback is described as a "quattro", which I guess is the same as a "quadruple", though neither name really defines a category I could say I really understand. This is a strong blond ale, with something heavier and all-guns blazing about it. There's definitely an apricot note in there, but it has other fruits and flavours as well. In all, I'm glad I found the Scheldebrouwerij stand at this festival. They make some fantastic stuff, and I'll have to try to find their products again. At the St Bernardus stand, we had a taste of Prior 8 just to try it on tap, as opposed to bottled, which is how I normally drink this long-time favourite. Then, however, we tried the brewery's blanche, St Bernardus Wit. It's an interesting take on the form, with banana and maybe even mango drawing a lot of your attention. Bob had it on day two and felt it was missing the classic warm spices and citrus of other "white beers". I thought it was brilliant, though. I tried a Carolus Classic, which I've had before on tap, but this one at the festival was not as good as I remember it. It was too sweet and even a bit watery. Not really sure why it was different to previous occasions, but there are a million possible reasons. Outside the Belgian Beer Weekend, Bob, Fiona and I had one new beer at Chez Moeder Lambic Fontainas. We initially went there on the evening of day one so we could introduce Bob to the outstanding V Cense, which is now on my list of top ten Belgian beers. But we also sampled Val-Dieu Grand-Cru, which was sadly just far too sweet -- some nuts and date tastes develop as it warms up, but mostly it's just crystalline sweetie sweetness. Too bad. Back at the festival, Bob and I also tried St Feuillien Saison. This is a wonderfully hoppy and floral beer, with a hint of something surprisingly resiny or sawn wood about it. Bob said it sat in the mouth for a long time, with "a long essence". Evan, the journalist from TV Brussels who interviewed me at the festival, agreed, noting the pleasant "long aftertaste". I'm looking forward to that interview coming out now. (Update: it's out.) We spent a fair bit of time on Saturday with Evan -- who very clearly knows a thing or two about Belgian beer himself -- not only shooting the interview, but also collecting some footage for atmospherics and so on. It will hopefully go live on Sunday, 12 September, and be online around that date as well. I will post links or embed it here, of course! Overall, then, the Belgian Beer Weekend was a mixed bag. It gets top marks for tastes, obviously. I discovered at least one fantastic brewery I'd never heard of before, Scheldebrouwerij, and a few other valuable gems. It's just a shame the organisation of the festival didn't come anywhere close to the same high standards of the beers on offer. Perhaps next year they'll do things a bit more sensibly, and more people will be able to enjoy it. Eventhough I agree about the need-to-better-the organization part (especially the queues), I think that the token system is OK. Maybe they should introduce the pre-prepared bags of 10, 20, 30 etc. tokens, so that the staff would not have to (yes, very slowly) count the tokens for each visitor/buyer. As for the Schelde brewery, I could not agree more!!! The best surprise of the event. All theri beers are absolutely marvellous! That sounds ridiculous. Most beer fests here in the US have a preset admission price that gets you a set number of tokens or tickets, and then there are booths inside in case you need to purchase more. That way people get in quickly, get sampling quickly, and those that need more tokens can queue up after having already enjoyed some beers. I am so jealous my head may fall off! The advantage of the token system, though, is shorter lines at the beer stalls. If each beer stall had to accept money and give change, you wouldn't have to wait to get tokens, but you would still have to wait to get beer. What if you could buy the tokens the week before the festival? Or what if they had a whole line of token vending machines instead of a few stalls. It's shocking that they don't even prepackage the tokens.